Planning a trip to Southern Utah? My family has visited Best Friends Animal Sanctuary in Kanab, Utah three times. The first time was three years ago when I visited Zion National Park with my kids. We loved it so much that we planned a second visit with my husband during our last Spring Break trip to Southern Utah. On a trip with many highlights, this was my kids’ favorite place. Our most recent visit was with my extended family during our visit to the Grand Canyon North Rim. We had 14 people between the ages of 5 and 65, and a visit to Best Friends was an excellent addition to the itinerary. 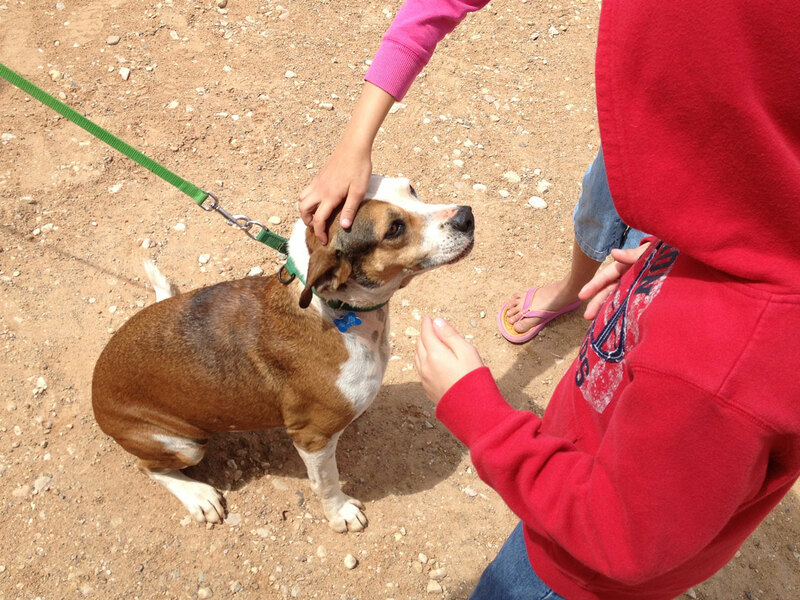 Free tours are offered several times each day at Best Friends Animal Sanctuary. On our first visit, this was a fun activity that gave us an overview of the sanctuary. It was also a great option for our large family group. We drove through beautiful Angel Canyon and learned about the history and different areas of the Sanctuary. It’s a large and impressive operation.The best part was stopping to see and play with cats and dogs along the way. Be warned: the tour will leave you wanting more! Making reservations online or by phone is recommended. However, on our first visit to Best Friends Animal Sanctuary, I just showed up with my kids (then ages 6 and 8) about 30 minutes before the tour. There was space, so they cheerfully added us to the list. If you have children under age 8 or have a group of 10 or more, they ask that you make your reservation by phone at 435-644-2001, ext. 4537. Kids as young as 6 can volunteer at Best Friends Animal Sanctuary. You may be put to work doing cleaning, feeding or maintenance jobs, but you’ll probably spend much of your time interacting with the animals. We played with cats for our entire afternoon shift. I found the online volunteer process to be trickier than expected because it required me to create separate logins for every member of my family. Liability releases are required for minors, and it took me a couple of tries to figure that out too. Volunteer shifts can fill quickly, so sign up early! We signed up a week or two before spring break and by that time, there was only one volunteer shift left all week. We rearranged our itinerary to make it work. My son is a vegetarian – the only one in our house – and he was pretty excited about the vegetarian lunch buffet served at Best Friends Animal Sanctuary every day. At $5 per person, it’s a bargain. It includes a salad bar, meatless entree (“meatball” subs the day we were there) dessert and water. Our whole family enjoyed it. If the weather is pleasant, be sure to get a seat on the patio. The view of Angel Canyon is gorgeous. You can take an animal on an outing or sleepover during your stay in Kanab! This helps pets practice with new people and new places and prepares them for adoption. Best Friends Animal Sanctuary has lodging on-site and a number of hotels in Kanab are pet friendly. Several local hotels offer discounts to Best Friends volunteers. This is a FREE day camp available during the summer months for kids ages 6-9. Your kids can go for one day or multiple days because the activities are different every day. A parent needs to be at the Sanctuary during the camp, so it’s a great time to volunteer. My children have been BEGGING to adopt a pet for years and I was the hold out. As we planned this trip to Best Friends Animal Sanctuary, I decided I was ready for a cat. My husband and I surprised our kids with this news on our way to Best Friends. It was like Christmas morning in March! We spent the morning meeting cats and discussing our options as a family. At the end of the day, Kelsey came home with us. She is a great addition to our family! Your new pet will be checked by a vet before you leave and previously spayed/neutered and microchipped. We were also given a collar, tag and food for several days. You will need to purchase a pet carrier from Best Friends or elsewhere before you leave with your pet. For the best price, consider purchasing one before your trip. Best Friends can help arrange transportation to your home if you are not able to take your new pet with you. Best Friends Animal Sanctuary is a bucket list kind of place for animal lovers. It’s a short drive from Zion National Park and surrounded by other fun activities for families in Southern Utah.